The Burlington Book Festival lands in Burlington, Vermont, on October 12 to 14, with an amazing lineup including Mary Jo Bang, Dan Chiasson, Maria Hummel, Mark Leyner, Bethany Morrow, and Sharon Olds. This is the last in a series of four interviews in celebration of the Festival. 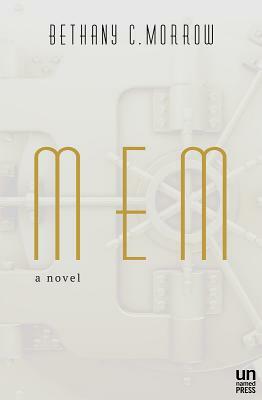 Bethany C. Morrow is the author of the debut novel, MEM, published by the wonderful small publisher, Unnamed Press. Publisher’s Weekly describes MEM as “ambitious and insightful, raising questions about memory, trauma, and humanity.” Morrow was an Indies Introduce Debut Author selected by the American Booksellers Association. Originally from California, she currently lives in upstate New York. Bethany Morrow: I think my writing process adapts to each individual project, but there are some places where I start. The transition from thinking about writing something (which is a step in the writing process) to literally writing about it requires, for me, a first line; an inciting incident, or reason the story is starting now; a character I know (or think I know for now); a sound (as in a song that matches the emotional tenor of the character or incident or); a climax. Once I have those things I write a first chapter, which tends to be establishing, so it's not very long. Like introducing yourself before you start blabbering on to someone who doesn't want to know you, lol. And then I see what I've learned from that introduction, and go back to thinking. Once I know the next few steps, I start writing toward the end of the first act, at which point I stop again and go back to thinking because things organically develop and I want to write the story not the story that first appeared in my head if it isn't true anymore. The process goes a bit like that through the climax, until I know how it ends. LN: What influences have helped shape you into the writer you are today? BM: A reader might be a better person to answer that. 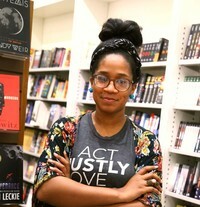 I can only say what meant a lot to me as a young reader/writer: Christopher Pike, Lois Duncan, Ethan Frome by Edith Wharton, The Great Gatsby by F. Scott Fitzgerald, and everything by Toni Morrison (especially up through Love, since that's when I was rabidly reading and rereading her, including essays and interviews). LN: What was the kernel of the idea for your novel, MEM? What inspired you and influenced your writing as you worked toward its completion? BM: The kernel of the idea was making cloning more interesting than I find it in real life, lol. And then determining that the most interesting person in that world would be such a clone, but one that doesn't match her intended purpose, and because there's an expectation on her to prove her humanness, she has such a shallow pool of "respectable" identity expression while others who are never questioned are free to be inhuman. BM: My son, of course, before everything. The right words. A sound too perfect to be translated into words. A shared happiness. BM: I started reading What It Means When a Man Falls From the Sky by Lesley Nneka Arimah, and from the first page, the gasp I made at the end of the first story, it's just intoxicating.